The Labconco XPert Weigh Box Glove Box offers you isolation when handling handling hazardous particulates and powders, microorganisms, low-level radiochemicals, carcinogens and asbestos. This filtered glove box has ISO Class 3 Conditions, and includes an anti-static ionizer fan, and inlet and outlet HEPA filtration combined with a leak tight physical barrier of protection. This glove box is ideal for weighing applications with a balance vibration isolator and ionized air to reduce static charge. Inside this isolator glove box is 13 cubic feet of working space, with a ceiling mounted 5 amp duplex outlet, a black, chemically resistant, sealed work surface, neoprene gloves and a 22 watt fluorescent lamp. The Labconco XPert Weigh Box Glove Box is constructed from one piece, mold formed polyethylene, with a ¼” thick laminated, steel framed, gasketed, safety glass window, that’s removable when adding in instrumentation. The transfer chamber of this filtered glove box has easy latch, counter balanced doors, that lift upward to quickly get out of the way. The built-in blower has a airflow range of between 13-75 CFM, and can be from the upper control panel where users can also toggle power to the blower, outlet and lamp as well as monitor the static pressure. 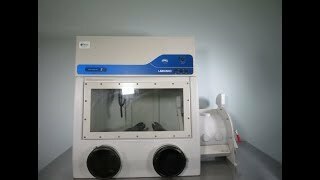 This Labconco Xpert Weigh Box Glovebox has been fullly inspected and is in excellent condition. All of our lab equipment comes backed with our standard warranty. Should you have any questions, please don't hesitate to contact us.